Is the money you are spending on heating your home, escaping through your roof room? Do you have a dormer bungalow or another property which has a room in the roof? Fed up that grants normally only cover laying insulation in the easy flat parts of the loft? Well be fed up no more! 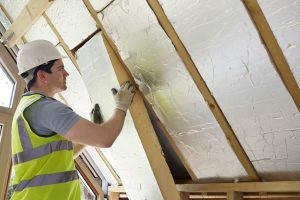 Happy Energy can now offer grants for all homes to insulate the whole room in roof area including the sloping areas, dormer windows and gable walls. *The work could be free of charge, but this depends on the cost of the works, how big your home is and what your main source of heating is. Whilst you do not need to be on benefit to get a room in roof insulation grant, if you are on benefit the grants are higher. Homes heated by mains gas get smaller grants than homes heated by more expensive fuels such as electric, but depending on how much work is involved, gas homes may still be able to get the works for free so call now to find out more on 0800 0 246 234. Use the form on the top right to book your free room in roof insulation survey now! How do you insulate the sloping areas? We typically would install a new layer of plasterboard with an insulation layer over the top of your existing sloping ceilings or, depending on the amount of space available, we may be able to insulate between the tiles and sloping ceilings. Check the suitability of your home – call Happy Energy on 0800 0 246 234. Book a visit from one of our experts. Receive a quote from our team. Book a date for the work to be completed. It shouldn’t take more than a day.